You can set up the Windows Media Center to enjoy your favorite photos, music, TV, and videos by using just your PC. Viewing stuff on your PC is pretty easy if you don’t want to hassle with configuring Windows Media Center in Windows 7 to work with your home entertainment system. Click the Start button on your remote (if your TV is set up) or choose Start→All Programs→Windows Media Center. If you’ve already completed the setup and you want to change the settings, scroll to Tasks and choose Settings→General→Windows Media Center Setup→Run Setup Again. You see the Get Started screen. To protect your privacy, don’t take the Express setup option. Click Custom. Click Next to continue to the Setup screens. WMC asks whether you want to join the Customer Experience Improvement Program (CEIP). 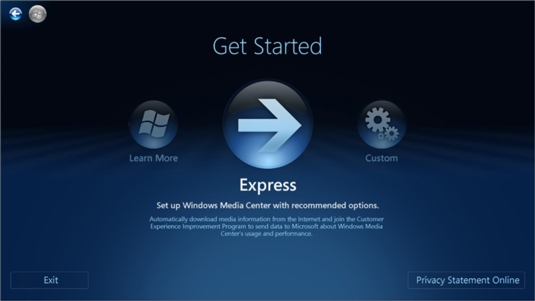 The Customer Experience Improvement Program claims to maintain your confidentiality, but, through your Internet connection, Microsoft can collect your IP address, along with detailed information about everything you do and watch with Media Center. Select No Thank You and click Next. WMC asks whether it’s okay to connect to the Internet to find cover art for albums, music and movie information, and TV program guide listings. Choose Yes (this one is fairly harmless) and click Next. WMC advises that you have completed everything you need for enhanced playback (whatever that might be), and asks whether you want to configure its Optional Setup, which helps Media Center configure your TV tuner. Choose I Have Finished and click Next. Media Center shows you a You Are Done! screen. Media Center is usually able to configure the TV tuner on its own, but if you’re worried about it getting things right, you can choose to work through the optional screens. You can always go back to the set up settings and correct any problems later. While you’re thinking about it, take a second to double-check your main privacy settings. Scroll to the Tasks menu and choose Settings→General→Privacy→Privacy Settings. From this dialog box you can turn on or off the two privacy settings. Use the Guide and Send Anonymous Information: Allows Microsoft collects information about how you use the guide. It can use this information to make the guide more accurate. Microsoft isn’t clear about whether they’ll tracking what you watch, so you should expect that they will. 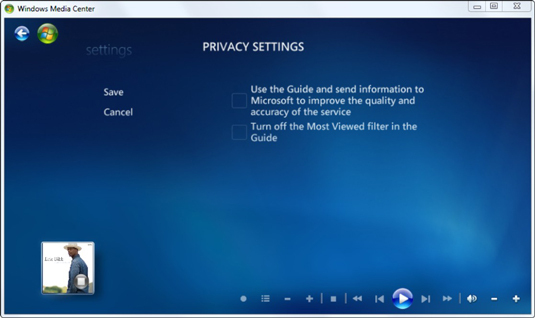 Turn Off the Most Viewed Filter in the Guide: Media Center keeps track of the shows you watch the most so that it can present the Most Viewed list as one of the categories in the guide. This will narrow the list of TV stations displayed, but Microsoft could also use the information for marketing purposes. Choose the options you’re comfortable with and click Save. Your Media Center is ready for you to take the reigns and start watching. Setting up Windows Media Center with an entire home entertainment center combines all the frustrations of assembling a complicated PC with the joys of figuring out how to attach your satellite box, where to hook up the speakers, which stack of books to stick under the TV, how to keep all the wires from pulling each other out, and what to do with the subwoofer. In fact, one of the very best reasons for buying a WMC component system from a local store is that you can hire the company that sold you the unit to put it together for you.